Picture framing Brisbane is what everyone types into Google when they are looking for a custom picture framer in the Brisbane area. Fix-a-Frame is a frame shop that was established at Mount Gravatt on the south-side in 1991. The framers who build and construct the frames really take pride in their workmanship and are not only passionate but qualified to do the job. Often to many people’s surprise, it is a fact that the craft is more than a hobby and is actually a trade much like plumbing or electrical work. The skill required to design and make the best solution for displaying images is one that is learnt over a few years but it is only with time that the craftsman becomes a true artisan. Not all picture framers are created equal with many frame-shops just opening their doors with little ideas about the proper techniques required for framing jerseys or other complex memorabilia framing challenges. Making a frame for something more unusual or unique than just a ready-made is what true frame crafters would construct when asked to make something to suit a special photo or any object that needs to be displayed either at home or in a public art display. Even something as simple as how the back of the frame is finished and the wire is tied if only a small part is quite important. The pride that each individual frame maker takes in their work is conveyed into the final design and that design lives on in people’s homes for generations to come. 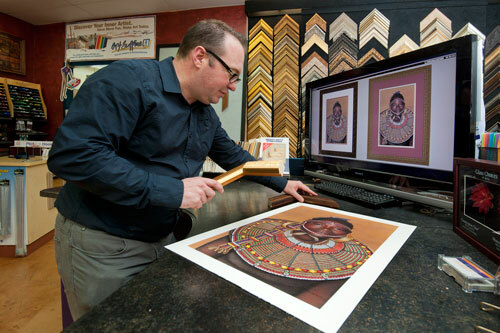 Qualified custom picture framers are trained professional in many areas. Matting is the cardboard that surrounds most pictures framed under glass. Its purpose is two fold. Firstly, it protects the artwork by providing a space or air gap between the picture and the glazing. This is important so that moisture doesn’t enter the paper or cause a photograph to stick to the glass. There are other protective properties like the active role some boards take in preserving the pictures by absorbing common pollutants and trapping them in a chemical bond. One brand of mat board manufactured by Nielsen & Bainbridge called alphamat has this micro-chamber technology incorporated into its manufacture. Secondly, matting is the primary colour enhancing section of the presentation. The colours chosen can convey different moods and also control the contrast within the frame design. There are many colour choices and combinations of colours. The common color schemes include Monchromatic or the use of one colour with its tints or shades, Complementary or the use of opposite colours from the colour wheel, Tertiary or Analogous. Interior designers will also use these theories when choosing the decoration of a room or the design of specific pieces or objects placed into the built environment. The easiest way to see what effects different choices has on the finished design is to hold up various corner samples or swatches to compare the results. There are also visualization software programs that allow the consultant to combine different mixtures and apply them around your image so you can see what the finished effect is going to be like. Sometimes there are slight variances from what you see on screen to the actual finished item but they do help to get the balance and size right and it does help an inexperienced home decorator to see the possibilities a little better. 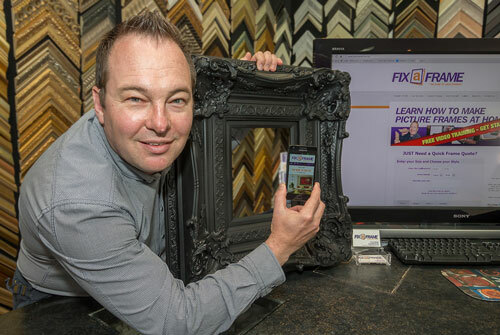 Fix-a-Frame is one of the shops where you can use this software to help design your picture frame in Brisbane. Usually it takes a little time to go through the various options and arrive at a design that is appealing to you and will suit the décor where you will hang the picture. It can help to take samples of fabric from your soft furnishings, paint swatches that represent your wall colours and even photographs of the room with you when you visit the showroom. Then you will be able to hold up the desired frame sample next to the colours you already have at home. This can help you to avoid choosing something that looks out of place or creates a dischord. Sometimes the frame designs can incorporate the actual fabrics or timbers that match other items you have on display. These sorts of designs are where you get true customization to match your unique taste. Another way to help with getting a harmonious outcome is to take corner samples how with you to hold up and compare to other pictures you may have framed at home. Some framers allow you to do this and if they don’t you can always take some photos on your phone if you need to compare things before going ahead with a custom order. With a huge range of frames that are available the possibilities are somewhat broad and endless. There are modern silvers with smooth brushed finishes. There are antique ornate mouldings that suit a more classical approach. Distresed timbers, stained woods, embossed patterns, elegant veneers, bright golds or classical gilt models. With new designs arriving every month there is bound to be something that takes your fancy. Many of the great styles are created in Italy and we have some wonderful and exclusive products that make people reminisce of their European vacations. These type of materials really add great flavor and feeling to one’s décor. Although there are cheap picture frames available like some of the synthetic or MDF types that Ikea or the other dollar chain-stores sell. What we’ve found is that most people desire to improve their home and lifestyle and this improvement is best when the style matches what your aspirations are. The best thing about getting a frame made at Fix-a-Frame is that all the workmanship is done on the premises by trained professionals. You can actually discuss your specific requirements with the people doing the work rather than just leaving it up to chance that the maker will understand what the salesman has chosen. When you next need a picture frame or something special to display your memorabilia or any other item you can be assured you will get a good result. Our guarantee is to make sure you are totally delighted with the finished result so the next time you are considering picture framing Brisbane please visit us for a welcoming and delightful experience.